Is this really strategic? Or can this be dealt with outside of the planning process? It’s a question we hear often, especially in organizations that have multiple departments supporting strategy execution. Perhaps one of the most challenging aspects of the planning process is keeping you and your teams thinking at the right elevation during both strategy creation and execution. Using the time intended for strategic conversations to solve operational problems or issues that aren’t truly strategic is a sure-fire way to derail any planning and execution process. As defined in the chart, programs, processes, initiatives that help create the future are strategic. Operations improve the current state. This chart is extremely detailed, and it needs to be. 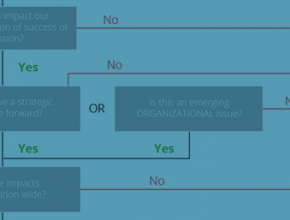 In such a large organization with many departments and ideas, the more detailed this chart, the more strategic the organization can be in making decisions. The shift or change is significant in some way. This is a great start to helping keep your team thinking at the right elevation when it comes to strategy. We hope the template and example we provided help you and your planning team! Far to often I have been involved in planning meetings that consistently get side tracked or even hi-jacked into operational planning solutions. Almost becoming self-serving in nature… This template is a very helpful and useful tool for strategic planning sessions.